Today, cloud computing is at the forefront of the shift to the digital business and enabling companies to adapt to these changing models, both strategically and operationally. 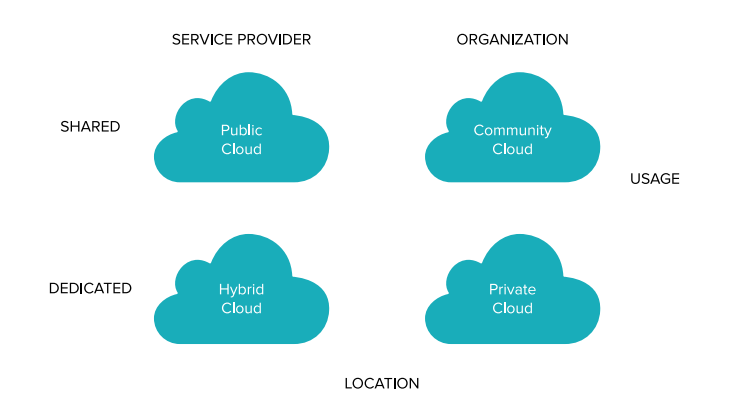 Companies with a cloud-first strategy have learned that the cloud’s real value comes with being able to delegate the Service Level Agreement (SLA) of an entire solution, from infrastructure to application, instead of components. It is also widely recognized that integrated suites reduce complexity, increase reliability and cost less—it’s just that now, with cloud, the suite includes hardware, security and operations. Most agree that the cloud paradigm has cost and convenience benefits: availability, speed, agility and TCO, enabling faster development processes and providing higher reliability and lower risk. Companies that take an ad hoc approach miss out on many of cloud’s benefits and experience a variety of pitfalls. In the current state of the market, not all cloud providers can step up to the challenge of providing an integrated offering, and that forces companies to manage more than they want to. 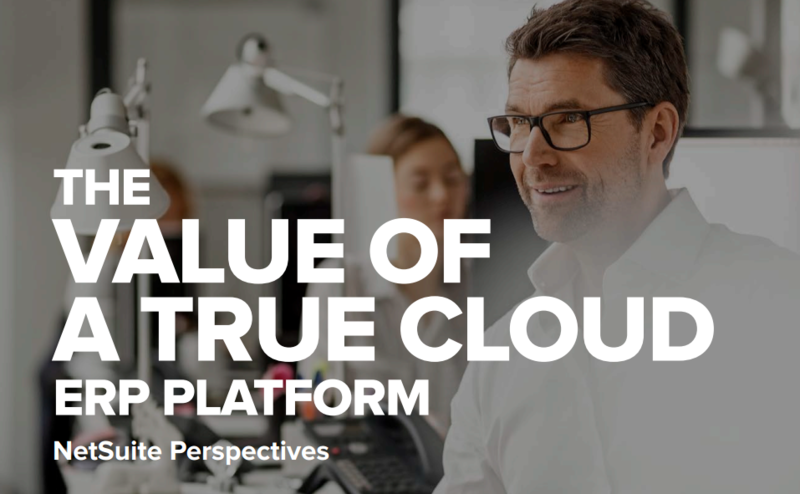 As a leading Cloud ERP company, NetSuite has championed the cause to deliver not only a true cloud platform but also strived continuously to develop a truly integrated suite for our growing global customer base of more than 40,000. Further, the SuiteSuccess customer engagement model is already helping hundreds of new customers deploy the platform faster and leverage leading business process practices to both create and realize value within their organization much sooner than traditional approaches. 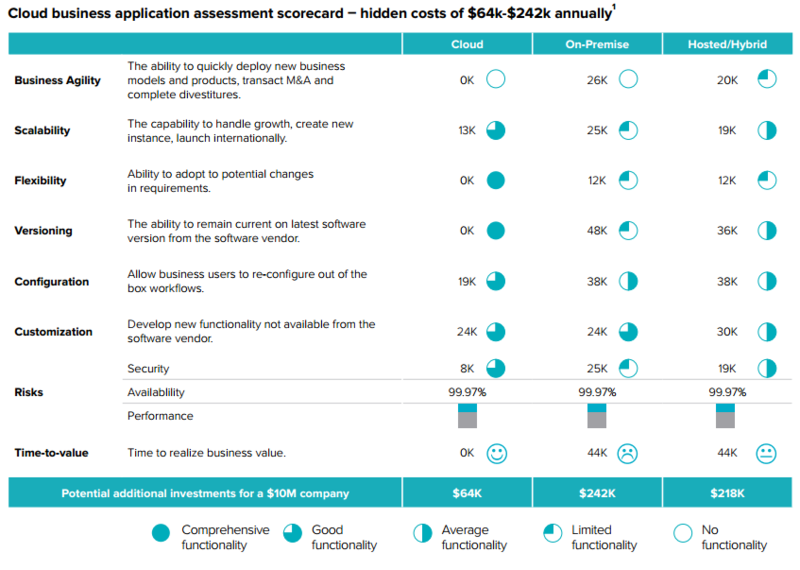 In this document we hope to provide you our perspective on the components and scorecard to use to not only evaluate a true cloud solution, but also analyze for yourself how our various platform offerings help you to meet your organization objectives today, adapt to the industry disruptions of tomorrow and realize savings of more than 20%-50% in Total Cost of Ownership (TCO) alone1 or incur $64k-$242k annually in hidden or unexpected costs2. NetSuite is offered as Software-as-a-Service (SaaS). The applications are accessible via a web browser or mobile app. Unlike on-premise software, NetSuite customers do not have to be involved with managing the underlying cloud infrastructure including network, servers, operating systems, storage and application upgrades. NetSuite has a single instance of the application. Each tenant can make customizations and configurations that are rendered to the views they see and/or invoked when using the application. Most customers share a common database instance with other customers. In situations where customers need higher performance, NetSuite offers Premium Performance Tiers with dedicated database instances. Some customers start on the shared database and migrate at a later point to their own dedicated database. This last situation (a shared database) would be considered as the highest degree of multi-tenancy. 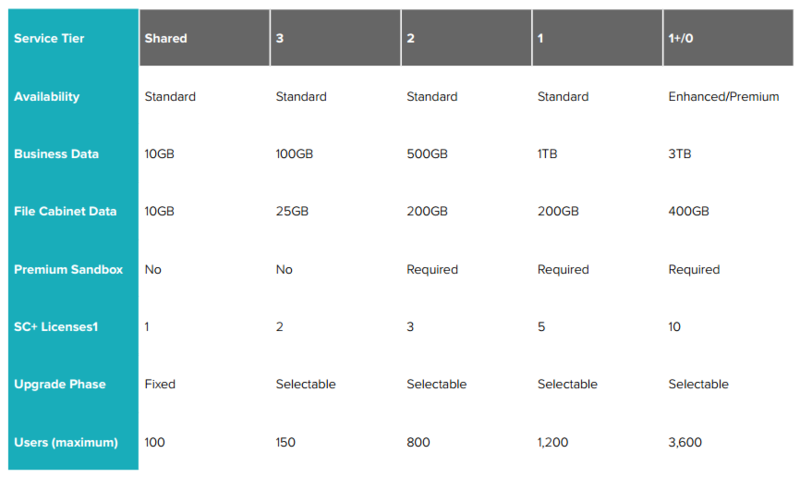 Virtualization would, by definition, then offer the lowest degree of multi-tenancy. version of the application globally, allowing them to reap benefits from economies of scale, less capacity planning, increased agility, scalability and IT costs. Two-tier ERP is a business and technology strategy that enables organizations to keep their investment in existing ERP systems, i.e. SAP or Oracle, while deploying cloud-based ERP, i.e. NetSuite, at newer subsidiaries. As large enterprise’s expand and restructure through mergers and acquisitions into larger companies, one of the strategies to preserve their existing ERP investments is to adopt a so-called hub and spoke approach to ERP. All business units (headquarters and subsidiaries) use a single application instance. Enterprise hub and business unit spoke use same application—but may have more than one instance. Business units choose from an approved list of spoke solutions which allows the subsidiaries to pick a solution that best suits their requirements. For example, localized business units often need to address specific customer billing and payments practices, and local regulatory requirements. Companies in virtually every industry are using sophisticated business software to fuel their growth but many are still struggling to keep up with their growth and manage costs effectively because of a hodgepodge of disconnected functional systems causing process bottlenecks and employee productivity issues. 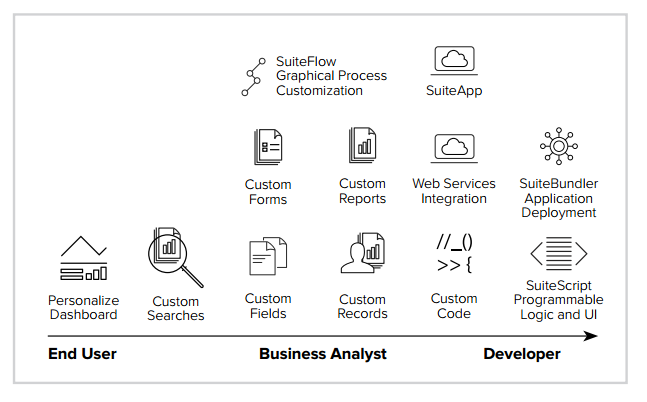 Integrated business software suites are transforming how companies run, and enabling them to transcend growing pains that previously were holding them back from taking their business to the next level of profitable growth. 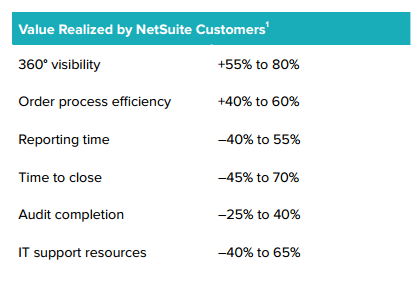 In an ROI study by independent analyst firm Nucleus Research, customers using NetSuite’s integrated cloud business suite accelerated their financial close times by up to 50%, increase sales productivity by 12.5% and increase inventory turns by 50%, amongst other efficiencies. ensure compliance with regulatory requirements. 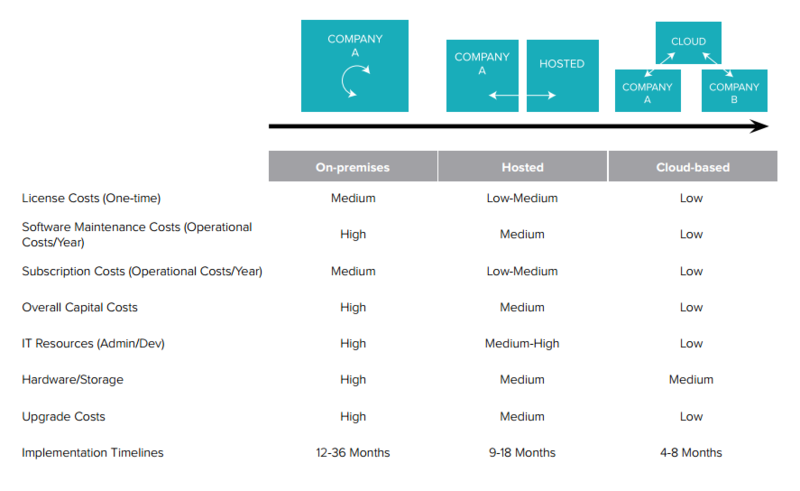 It is then no surprise that some of the strategic business leaders that we engage with evaluate their cloud computing platforms not only on Total Cost of Ownership (TCO) criteria alone, but also engage their line of business operational leads to actively participate in the selection process to determine the true return on their investment that is aligned with their business strategy and objectives. In this section, we present both a typical business need evaluation scorecard and a Total Cost of Ownership (TCO) scorecard that can assist, at least at a high level, in aligning business and IT requirements, eliminate siloed platforms and solutions that create spaghetti environments and justify the needs for an integrated platform that is aligned to your business objectives, can drive business process improvements and thus preserve your company valuations. Increase gross margins from 35% to 36%-37%. Reduction in time to add new capabilities. 160 hours per capability at $75/hour. Enable your business strategy to expand into new markets and channels. 320 hours at $75/hour per upgrade. 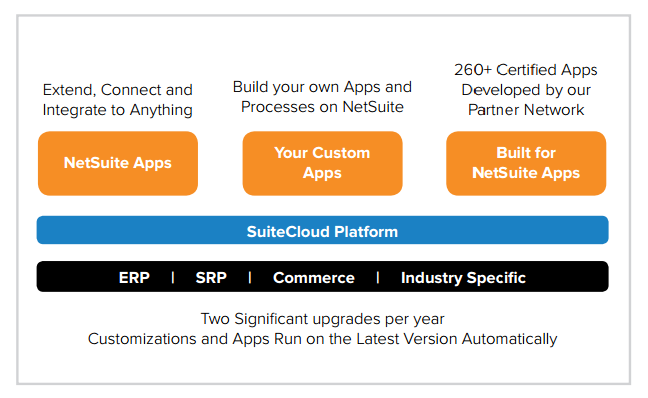 2 upgrades/year done by NetSuite. NetSuite’s patented “phased release” process ensures that 100% of our customers are on the same version. 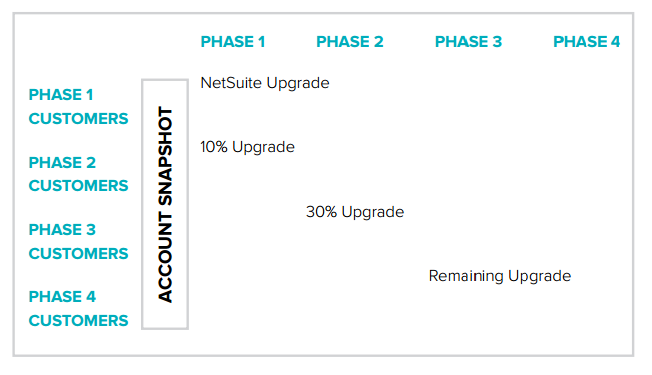 Typically, NetSuite plans for two major upgrades per year and ongoing minor upgrades throughout the year. A release preview environment is also provided to the customers. Certified customizations carry forward and customer use cases are incorporated in QA testing. 1 IT FTE reduction, effort shift to business user. 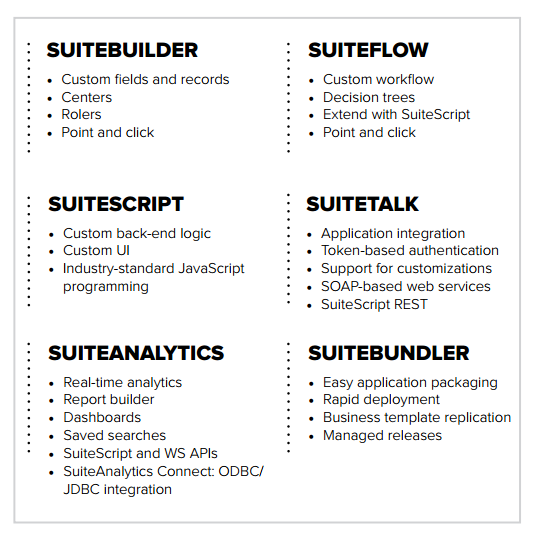 configurable by the business users, NetSuite SuiteSolutions offers a library of ready-tolaunch solutions to address common business requirements across market verticals. SuiteSolutions facilitate accelerated timeto-market and reduce development costs—enabling customers to achieve business agility with fewer resources. 160 hours at $75/hour per customization. Faster execution and elimination on customizations. 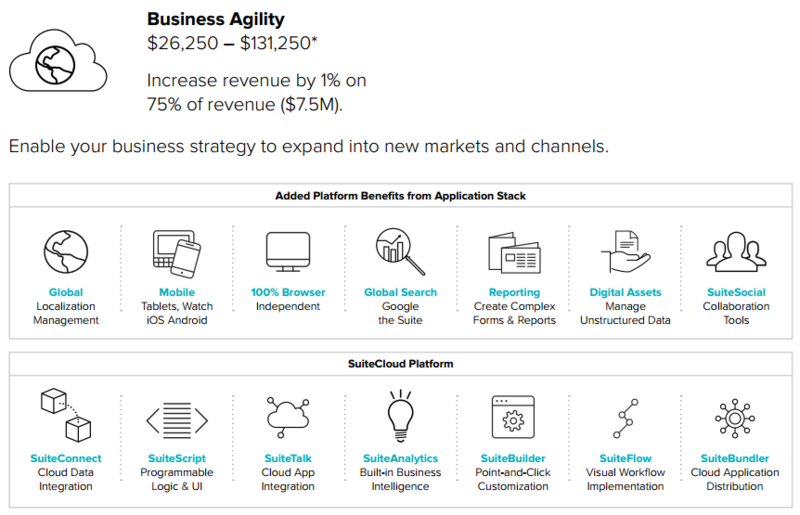 With SuiteCloud you get the best of both worlds—centralization in a suite for core business function, data and analytics to avoid unnecessary hairballs plus the most flexible system for customization, extension, integration and development in cloud ERP—making “smart integrations” easy and putting the business processes that give you competitive advantage right in your system of record. Analysis assumes 1% customer churn due to security issues (500 customers & $20k revenue/customer). NetSuite employs stringent round-the-clock monitoring tools, controls and policies and a dedicated tenured security team to ensure that it provides the strongest security (Application, Network and Data) for its customers. This results in benefits to our customers by getting stringent security certifications for their business applications and lets them enjoy security controls such as fully guarded premises and physical access management that are economically unachievable with typical in-house, on-premise deployments. Benefit analysis assumes that customer evaluates this SLA for all platforms it may be considering. 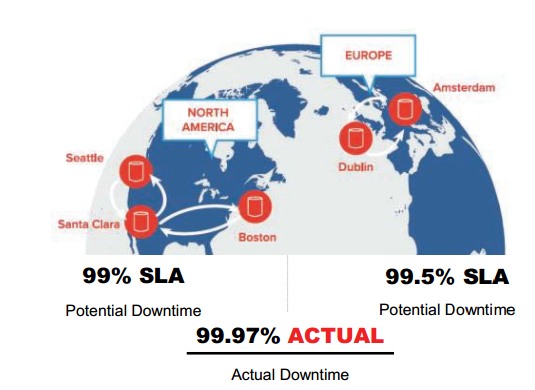 NetSuite maximizes application availability by operating multiple geographically separated data centers. Its data center redundancy includes data mirroring, disaster recovery and failover. NetSuite has achieved a historical uptime track record of 99.96% over more than the past five years and guaranteed uptime of 99.5% backed by transparent Service Level Commitment. To add to its commitment, NetSuite’s SLC is backed by a service credit if availability commitment isn’t met. System status is displayed at all times at http://status.netsuite.com. Application performance is key to NetSuite and our customers. NetSuite’s built-in performance monitoring tools provide deep insights into the application’s behavior and exposes granular details about performance metrics. NetSuite packages the experience gained from tens of thousands of deployments worldwide amassed over two decades into a set of leading practices. These practices pave a clear pathway to success and are proven to deliver rapid business value. Intelligent, staged implementation begins at sales contact and spans the entire customer life cycle so that there is seamless continuity from sales to services to support. Most ERP vendors have tried to solve the industry solution problem with templates, rapid implementation methodologies, and custom code. NetSuite took a holistic approach to the problem and productized domain knowledge, leading practices, KPIs and an agile approach to product adoption. The benefits of this are faster time to value, increased business efficiency, flexibility and greater customer success. NetSuite is aligned and committed to your transformation initiatives. As a strategic partner we will take this responsibility extremely seriously and are ready to bring our expertise and cloud solutions delivery experience to your organization. Plan and schedule a value assessment engagement to confirm and validate the platform value that can be realized with NetSuite solutions. Establish a joint executive sponsorship and governance team to track and monitor our strategic partnership.